The Founders of My Interior Design School are celebrating 10 years in business. Here they share their success story. Now established as one of the UK’s leading providers of interior design tuition, the founders and Directors are passionate about helping other women, via the courses, start their own creative businesses. Here they tell Interior Designer magazine how they got from start-up to success and share some of their secrets to getting from passion to profit. It took just four months from a quick conversation at the school gates (daughters in the same class at school) for the duo to launch their business and run the first colour workshop in 2009. Rachael was teaching in Higher education at the time, “I had always wanted to run my own private design classes… so I was thrilled when Anne told me about her interiors background and suggested we run them together”. Anne commented, “I knew Rachael was an interior designer and tutor… and one day we started chatting about design shows in London. I told her I used to organise them”. Since then, My Interior Design School has gone from strength to strength, running face-to-face workshops and offering a portfolio of online courses. The pair has taught hundreds of students from around the world, including Ecuador, Nepal, Germany, France, Hong Kong, Portugal and Norway. “It has been a lot of hard work”, says Anne who is the Course Director at MIDS and manages the student experience. “But honestly, the 10 years has flown by and it is so rewarding to see where the business is now”. 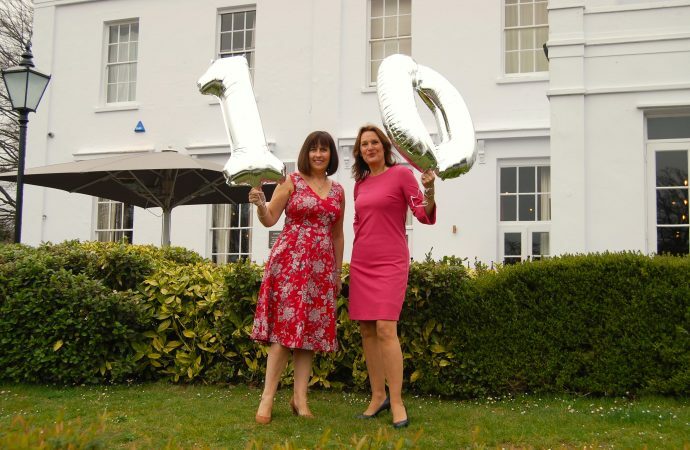 In celebration of 10 years in business, Anne Wall, Course Director and Rachael Kilby-Tyre, Design Director, My Interior Design School, share their 10 Top Tips for Business Success. It was probably a bit ambitious to run a face-to-face workshop so early on – just 4 months after our first meeting, but we learned so much by actually doing it. There is a lot to be said for ‘just getting on with it’. Don’t think you have to be 100% ready, because you probably never will be. Have a go, but learn from any mistakes along the way. It’s vital to listen to your customers and any mentors or advisors who you might be lucky enough to have on-board. It can be quite daunting to keep asking ‘how am I doing?’ and ‘how can I improve?’ as you may not want to hear any negatives in those early days. But in the long run, it really pays to take on board any positive criticism. We did spend a lot of time looking into ideas for courses and workshops which didn’t always work out. For example we were convinced that we could transform the market for styling weddings and parties. But it wasn’t our core business. At the time, we were really disheartened and thought we had wasted so much time and effort. But looking back, it was good to recognise that sometimes you should just stick to what you do best. And in our case that is inspiring our students to create beautiful homes – for themselves or clients. Anne’s background in PR and marketing had given us a good head start on how to promote ourselves to the Press. Our courses have been featured in lots of national and international publications now, but we would advise anyone starting out, to try your local paper or radio station first. They might be interested in your story and love anything ‘new’. After that and when you’re feeling more confident, try the regional glossies and if your business is a national one, give it a go. You are your best PR! We are quite confident in what we do. This may come down to our personalities, our 25 years’ experience, loving our jobs and the success we’ve had with our business. Probably a combination of all of those things. But we still get nervous and at times have to remind ourselves it’s good to get out of our comfort zone. The best example of that is being asked a few years ago to appear as experts on stage at the Ideal Home Show. We are very used to public speaking – we do it all the time in our Design Lectures and workshops. But anyone who’s been to the Grand Hall at Olympia will know, as well as being a fabulous, iconic landmark building in London; it is also huge. To stand under that enormous domed roof in front of hundreds of visitors, hanging on your every word, gave even us a few sleepless nights. We are now invited regularly as experts to the show and have had the added pressure of live broadcasts. But we feel a lot more confident and really enjoy the challenge of delivering a great talk to interior design fans. Whatever your business, it is crucial to be in tune with your customers or clients. We are genuinely inspired by our students and are passionate about our company ethos of ‘unlocking their creativity’. It is so satisfying to see where one of our courses leads them. Our students enrol on a course for lots of different reasons. And we love to see them follow their passion and help make their design dreams a reality. Over the decade of delivering our courses, we’ve seen students start their own consultancies, open their own retail business, become property developers, fabric designers, bloggers, home rental stylists, colour consultants and hotel designers, to name but a few. When they start a course with us, they never think they can do it. The best part of our jobs is to help them on their way and see what a difference to their lives, one of our courses can make. We have been really fortunate to have almost the same team working for us as when we started in 2009. So our technical team, marketing, branding and tutors have all helped with our success. But probably more importantly, they are a joy to work with. We realised early on that with just two of us launching the company, it would take a lot of effort and hours. We made a conscious decision then to surround ourselves with a team of people we liked, respected what they do and then let them get on with it. A fabulous admin manager has recently joined us and so we are feeling very happy and confident of moving the business forward for another 10 years. The business plan we wrote back in 2009 (albeit very quickly and reluctantly having to address some of the thorny issues of financing and forecasts) bears very little resemblance to the business it is today. Initially we had plans to run interior design workshops up and down the country – inspiring future designers from Hull to Hemel Hempstead! In reality, there simply weren’t enough days in the week to deliver enough courses to make it worth our time and effort leaving our children and lives back in Cheltenham. Once we realised that students were prepared to come to workshops in our beautiful Regency spa town, we could offer a range of courses throughout the year, and that’s what we still do. If you’d asked us back in 2009 if we thought we’d end up teaching students in every continent, we would never have believed it. Thanks to our online courses being available anywhere in the world, obviously our market has opened up massively. This may not be an option for everyone, but we still encourage our students who are planning on changing career to ‘think big’. Create a vision board and put on there some fabulous, inspiring images to represent how you see your lifestyle and career in 1 or 2 years’ time. Then get any skills you need to succeed, immerse yourself in your chosen business, work hard, enjoy it and make that dream a reality! We realise that we have been very fortunate in working well as a partnership and that we bring different skills to the business. Working with someone else or in a joint-venture can be a fabulous way to share the ups and downs of running your own first venture. If you are considering a partner, look for someone who can add a different skill or way of contributing to your enterprise. Consider running a small project together before you make any commitments, to make sure you are a good team and work well together. Launching My Interior Design School 10 years’ ago has taken a lot of grit and determination to get to where we are, but it has been the most rewarding journey. To see how our students flourish, the way our courses are now enjoyed around the world and together with our own personal challenges and achievements, shared with our fantastic team – launching My Interior Design School has been the best job ever.